2/8/18- #houseofvans prsnts LAUNCH PARTY for #CHIMAPRO2 @chimafergusson w #freebooze #skateboarding #livemusic @WEYESBLOOD RSVP NOW! 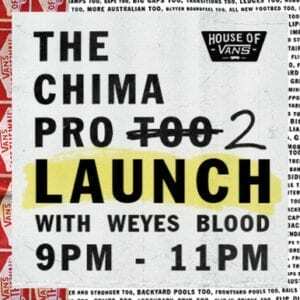 Please join us as we celebrate the launch of Chima Fergusson’s second signature shoe, the Chima Pro 2. There will be an open skate session with music by the legendary DJ Stretch Armstrong, and a performance by Weyes Blood. Copyright © 2008 The Printup List 'You no Longer need to know the right people' All rights reserved. Powered By Blogger.